It sometimes feels as though every time you turn on the TV or open your web browser, you are greeted with a new trailer for yet another film remake or television show reboot. It is hard to deny that Hollywood has a soft spot for these remakes and reboots. But are the rumors true? Are we witnessing the death of the original screenplay like many movie goers say? Let’s take a closer look! 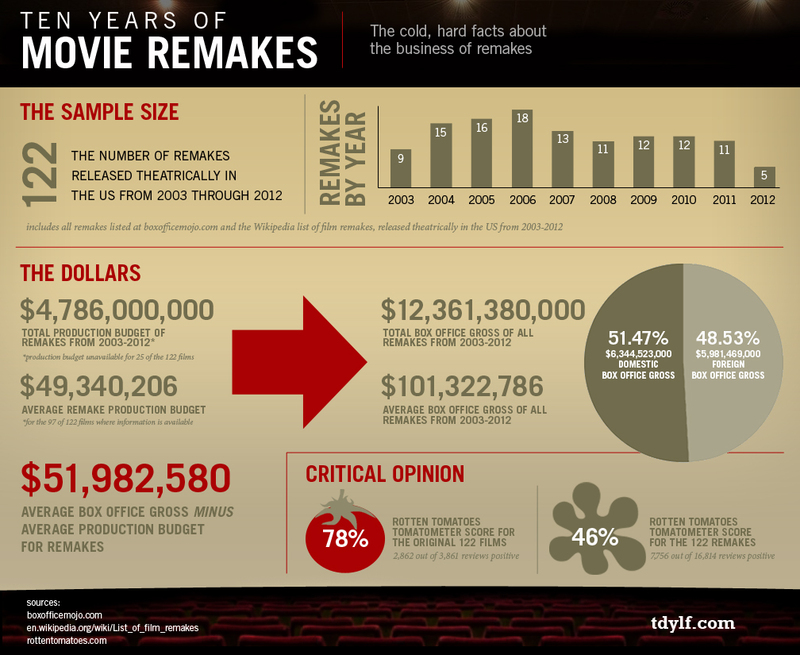 According to data blog The Droid You're Looking For, 122 remakes have been theatrically released between 2003 to 2012. The average critic score of all these films on Rotten Tomatoes? A middling 46%, whereas the original films had a median score of 78%. Critical prestige is low, but the box office? It's overflowing. The total box office gross of all these remakes was a startling $12 billion. Before we dive in to what this means for writers, let's think about some reasons why a studio might pick up a remake or reboot before an original story. Why Might A Studio Choose A Remake or Reboot? The Economic Times defines a risk averse individual as someone "who prefers lower returns with known risks than higher returns with unknown risks...S/he stays away from high-risk investments and prefers investments which provide a sure shot return." Risk aversion is perhaps the biggest factor in what has been called the Hollywood "Remake Age." It is a lot easier for a studio to sign-off on a remake or reboot because they know that the film or series has had success in the past. They know that they are investing their money into something with a built-in audience that will likely be profitable, or at least earn enough to cover production costs and break even. The unfortunate reality is that new can be scary to Hollywood. In a world flooded with information and endless advertisements, there are extreme advantages for a studio when it comes to marketing a remake or reboot because they already have a head start! There is already an existing audience that is familiar with the underlying story of the movie or show you are trying to sell them on. Viewers are more likely to tune in for something that they have already enjoyed or had interest in. Marketers also have the opportunity to step outside of the box with their efforts when the basic story is already understood. In many cases, they don't have to introduce characters or set up the scene, so they can make their promotions more edgy or different to help them stand out. Let's take, for example, the trailer for the reboot of America's beloved TV classic, "Roseanne." The pilot episode of the reboot brought in over 18 million viewers on Tuesday, March 27, 2018. Had we seen this trailer without already knowing the context of the show, it probably would not be very effective. However, since marketers know most of their target audience has seen the original show and know what it's about, they can take a different approach. They tell us nothing about what happens on the show or who Roseanne is, but rather focus on the nostalgia factor, showcasing the original cast reuniting and an audio clip of Roseanne's unforgettable laugh. A third reason why a studio might choose to recreate or reboot an original is simply because of new access to advanced technology. The evolution of special effects over the last century has been remarkable! New technology and editing capabilities allow studios to reproduce some of the most well-known and well-liked stories with updated visual effects, brighter and clearer pictures, and improved sound that can help bring that story to new heights. So, what does Hollywood's love for remakes and reboots mean for us writers? Should we pack up our laptops and go? A deeper dive into the history of film and television reminds us that many of the most successful movies and TV shows are ALSO better made versions of older stories. This infatuation with remakes and reboots is nothing new, and we must continue to wade our way through these tricky industry waters until we score success. Journalist, Shane Snow, says it best in his LinkedIn article, "Why Hollywood Makes More Sequels Every Year." "The movie industry is hungry for sure bets, but people are simply hungry for great stories, which keeps the industry investing in original screenplays in hopes of making the next surprise hit." While, yes, much of Hollywood IS searching for the sure-thing goldmines, there is an increasing opportunity for writers when it comes to original screenplays with the growth of new avenues for production, including online streaming giants Netflix, Amazon, and Hulu. Just last year, Amazon's "Manchester by the Sea" won the Oscar for Best Original Screenplay AND Best Actor (Casey Affleck), and it was the first-EVER film released by a streaming service to be nominated for the coveted Best Picture award. Keep writing. Yes, KEEP WRITING! Don't let the Hollywood man get you down. You never know what new opportunities are right around the corner. Long live the original screenplay!